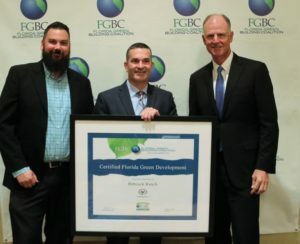 ORLANDO, Fla. – Southwest Florida’s Babcock Ranch, with sustainability designed into the entire fabric of the community, has been certified a Platinum “Florida Green” community by the Florida Green Building Coalition (FGBC), the leading certifier of green projects in the state. Developer Syd Kitson of Kitson & Partners was recognized during FGBC’s Annual Meeting in Orlando. Kitson has been planning Babcock Ranch for more than a decade.